The Compass IC 16-and-under Junior Challenge began in 2005 and was made possible by generous donations from The Compass Group since its inception. It is an IC competition, open to all 40+ ICs, for two girls and two boys (with an adult captain who can sit on court to help). 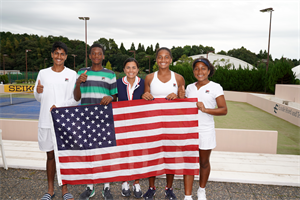 All juniors play both a singles and doubles match against other countries’ teams with all matches counting towards one overall team result. A regional event is played on each of the five continents and the winners of the regional events go through to play the Worldwide Finals the following year. We are very grateful to The Compass Group for their commitment over the years, which has finally come to an end. However, we are fortunate to have replaced the Compass Group funding with three other sources, so that the event will continue.